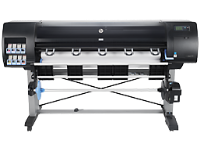 .Meet all your black-and-white and color needs with the HP DESIGNJET T3500 eMFP. Rated the most productive large-format MFP and offering low cost of operation, advanced copy/SCAN features and unattended operation, it is built for rigorous IT demands and top security. Introducing the next generation of HP DesignJet plotters. 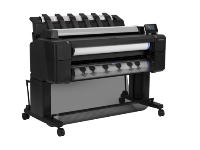 The 2-roll DesignJet T1300 is ideal for printing high volume line drawings, maps, presentations, and photo-realistic images. ​Turn orders in record time with the fastest 60-inch production printer for graphics.¹ Impress customers—efficiently produce outstanding color and black-and-white prints with six HP inks. Rely on powerful performance from an easy-to-use printer. 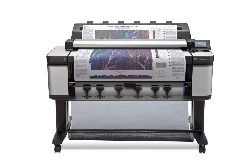 The HP Multi-dimensional Smart Drop Placement Technology enables the highest quality possible for a 6-ink system while guarding against potential media-feed or drop-placement errors. 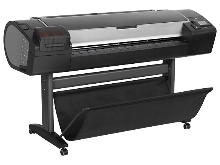 Designed with GIS professionals and Print Service Providers in mind, the 44" DesignJet Z5200PS presents the ideal mix of productivity and print longevity. Streamline your workflow - achieve greater productivity. • 160 GB hard disk provides a large buffer, reduces the chance of computer lock up and simplifies the process of reprints. • 300ml HP Vivera pigment ink cartridges provide fade resistant prints without sacrificing quality. • Save time with HP Instant Printing. Fast, easy file preparation and automatic nesting, preview, orientation, and crop marks. When it comes to speed, quality, and consistency, this HP large-format Designjet is hard to beat—with over 1500 square feet of output per hour, outstanding quality with HP Vivera pigment inks, and breakthrough consistency with an embedded spectrophotometer. 1,500 square feet per hour. Shorten turnaround times and take on more projects. You can, when you have the fastest large-format printer in its class. media support up to 575 ft, like new HP jumbo rolls. Turn orders in record time with the fastest 60-inch production printer for graphics.¹ Exceptional color and black-and-white prints on many substrates. Count on advanced color management features backed by HP reliability and easy operation.